Orbea is pushing boundaries with the new Gain line. They set out with a goal of making an electric-assist bike that looks as normal/sporty as possible, as light as possible (13 kg max), affordable pricing, and climbing ability with decent range. Orbea’s new Gain M10 is the flagship drop-bar bike of the line. Can you spot the battery and motor? The simple control is the mode button, mounted on the top tube by the head tube. It changes color depending on mode to keep the cleanest look on the bike. There are options for handlebar-mounted controls. The charging port is just above the bottom bracket, and it’s a CAN (Controller Area Network) bus port which provides a single interface for charging, system diagnosis or attaching the optional external battery. The battery is very stealthily hidden in the down tube, the motor is in the rear hub, and you won’t really see it unless you are looking for it. There’s an extra battery that’s shaped like a bottle that you can mount in a cage. The frame are all carbon, weights are between 11.31 and 13 kg, depending on spec, and cable routing is minimalist and mostly internal. The lower end Gain M30 is carbon, with Shimano 105-level components, and prices in at $3999. The M20 goes to Ultegra R8000 components and comes up to $4799. Step up to the M20i and you get Di2 components and a price of $5799. Last but not least, is the M10 model. It has Dura-Ace components and a price tag of $8754 (adjusted for Euros, as this model isn’t slated for U.S. sales). 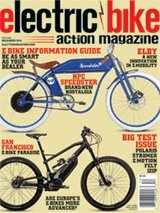 Orbea chose to use the 250W Ebikemotion 35, in all bikes, with a 36V/6.9Ah battery. The motor is actuated by a cadence sensor near the hub. There’s an app and smartwatch compatible app that allows deeper control of the iWoc system. Ride tracking, activity and GPS route uploading is available, among other functions. The bikes will interestingly cut off at 20 mph, making them a class 1 while other manufacturers have gone with class 3 (28 mph) road bikes. Across the board they use Mavic Aksium Elite Disc UST wheels, except the top of the line M10, which uses Mavic Cosmic Pro Carbon Disc UST. All bikes use Mavik Yksion Pro 700×20 UST tires.